On a warm afternoon in mid-March, the sun is streaming through the tall windows of the Seattle International Film Festival offices. It’s the kind of miraculous spring day that locals would never consider rebuffing by heading into a movie theater to sit still in the dark. But for the last 40 years, SIFF has wagered that people will do just that—on even warmer, sunnier days in May and June—and the bet has paid off. Maybe it’s the weather or maybe it’s the fact that festival prep has ratcheted into high gear, but the mood at SIFF’s Seattle Center headquarters feels frenzied and anticipatory. “We just confirmed our 80th film!” says artistic director Carl Spence, his eyes scanning a gigantic spreadsheet on his computer. 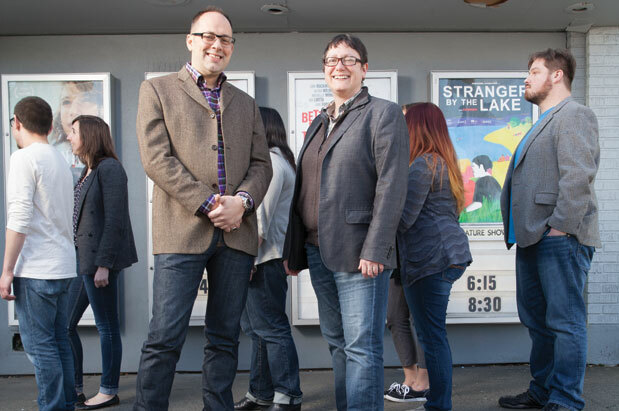 Spence started working at SIFF in 1994, on a three-month contract, and has since helped the festival grow to its current size, screening more than 400 films over 25 days. As he runs down the list, naming confirmed films aloud (To Be Takei, about the beloved Star Trek star; Richard Linklater’s Boyhood, 12 years in the making; and the documentary Yves Saint Laurent), he’s also animatedly throwing out over-the-top ideas for a wild SIFF birthday bash, one that would be worthy of a movie. SIFF’s previous decade saw a number of radical changes—among them an expansion to year-round programming in 2007, which gained SIFF a presence in the local indie film scene that stretches beyond those jam-packed three weeks in early summer. SIFF’s 2011 move from South Lake Union to the Seattle Center HQ (which has its own screening facility, the SIFF Film Center) was also major, though perhaps not as thrilling for the movie-going public as the organization’s takeover of the Uptown Theater lease that same year. Saving a once-glamorous movie house that had fallen into disrepair crystallized the idea that SIFF isn’t just about the fest, it’s about securing Seattle’s reputation as an independent-film-adoring city. The organization (which now has 6,000 members) is currently looking at ways to maintain stewardship of the three-screen Uptown in the face of rampant development on Lower Queen Anne—and deep-pocketed developers hungry for urban lots. SIFF has its eyes on another historic local theater: The Egyptian, on Capitol Hill, which closed last June when Landmark Theatres declined to renew the lease. Owned by Seattle Central Community College, the Egyptian will be used as a venue for the festival this year, and SIFF has submitted a request for proposal to the college in hopes of securing a longer-term lease. If SIFF were able to secure The Egyptian as a year-round venue, it would be coming full circle. SIFF first took over the space, formerly a Masonic temple (that hosted wrestling matches in ’70s), in the early 1980s, at which time the organization built it out as movie theater with pharaonic flourishes and named it The Egyptian. Looking further ahead, the SIFF staff becomes a bit more existential (as one does at this age). Spence rattles off several questions under consideration, with the milestone of 50 in the not so distant future. Given that so many people watch movies at home, he asks, “What is our place in cinema?” Since the three-week time span means some filmmakers miss out on networking opportunities with each other, “Would it make sense to change the shape of the festival—make it shorter, and more dense?” The schedule also coincides with Seattle’s busy tourist season, when hotels are booked up and flights are expensive, so “Should we change the timing?” Given the fact that some consider the fest overwhelming, “How do we grow without becoming daunting?” And finally, the question on every older person’s mind: “How do we reach the millennials?” considering that this age group is used to watching movies on small devices, usually while texting and/or Facebooking at the same time. Barrett, who’s been with the organization 12 years, notes that SIFF has already been making inroads with the younger set, enticing future independent filmgoers with series such as Films4Families (movies for little kids) and Futurewave (flicks for 13- to 21-year-olds). “We want to make sure it’s possible—and exciting—to bring young people to the cinema to see something other than Transformers,” she says. While answers to the big questions may remain murky for a while, what’s clear is SIFF’s commitment to local filmmakers and filmmaking. “Local submissions to SIFF are really strong this year,” Barrett says, noting that they’ve received 192 local entries across genres, which will be narrowed to around 40 of the best. Spence adds that it’s been exciting to watch Seattle filmmaking evolve, especially of late. “In the last five years, we’ve seen more ambition,” he says. “Local filmmakers aren’t just making films for a Seattle audience.” And while Seattle filmmakers have premiered work at the Sundance, Toronto and South By Southwest festivals, he says, “They’re still being Seattle advocates, thriving in Seattle and staying a part of the Seattle community.” The same could be said for SIFF.